Aspiring developers need to know what languages to learn; they need to select the right education and work on a skill set that will impress future employers and land their dream job. So what are the top programming languages? And what is the best one to learn? We’ve compiled a list for you that highlights the most in-demand programming languages based off current job postings on the market. This year Java grew by around 6% compared to last January, which was right around 62,000 job postings at the time. Java is just about to celebrate its 24-year birthday, and as a programming language, it has definitely stood the test of time. Java was developed by a Canadian computer scientist that used to work with Sun Microsystems, James Gosling. It’s a language that lets developers “write once, run everywhere,” (WORA), which mean its compiled code, also known as bytecode, can run on almost any platform without recompilation. Python was released more than a decade ago and was designed by Guido van Rossum, a Dutch programmer. It is a high-level programming language that is used as a ‘glue’ language to connect large existing software components. Also, its an object-oriented programming language that offer a vast collection of useful libraries and extension for developers and programmers. Python is often described as simple and easy to learn, with a readable syntax that decreases the cost and time of program maintenance. This year, Python is skyrocketing with an increase of about 24% with 61,000 job postings compared to last year’s 46,000. C++ was designed as an enhanced version of the C language by Bjarne Stroustrup, a Danish computer scientist. Its four-year development started way back in 1979 and was released in 1983. C++ is usually used for game development, drivers, client-server applications, system/application software, and embedded firmware. This year, C++ grew in popularity by 16.22% compared to last year with almost 37,000 job postings. C# is a Microsoft programming language and is a hybrid of C++ and C languages. It lets developers build secure applications such as XML Web services, client-server, Windows client and database applications that run on the .NET Framework. C#’s job postings didn’t grow that much over the year, but it’s still one of the most popular languages. PHP or Hypertext Preprocessor is created by Rasmus Lerdorf, a Danish-Canadian programmer. It’s an open source general-purpose scripting language for web development and can be embedded into HTML code from the server side execution. It’s commonly used to draw data out of a database on web pages. PHP’s job postings increased by 2,000 compared to last year. PERL’s first appearance was in 1987, designed by an American computer programmer, Larry Wall. Wikipedia says it’s a “family of two high-level general-purpose, interpreted, dynamic programming languages, Perl 5 and Perl 6.” Perl’s popularity didn’t increase this year but is still one of the most popular programming languages to learn. There are 256 known programming languages in the world. 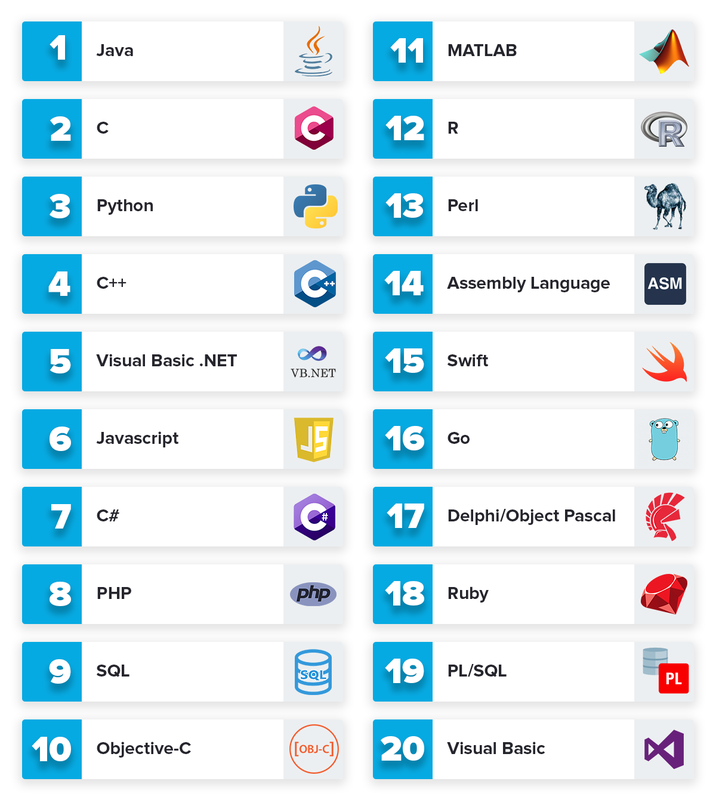 So TIOBE, a software quality company, made a list of the most popular programming languages which they update every month. One exciting prediction TIOBE made is that Kotlin, a statically typed, cross-platform, general-purpose programming language, currently at #31, can enter the top 20 because of its fast adoption in the industrial mobile app market. This prediction only shows that the tech industry is moving faster than it has ever been and if we don’t keep up, we would be left behind. It’s important to note, however, that the list doesn’t show the best programming language there is. Its main aim is to help developers know whether their skill is up-to-date with their level of expertise and what programming language they can add to their skill set. The key to becoming a successful developer is to have a never-ending desire to learn and grow. Mastering one programming language is commendable, but sometimes, it proves to be a liability as it becomes a developer’s limitation. Employers look for developers with different skills in programming who can be taught new languages quickly and skillfully. Therefore, learning a new programming language is imperative if you want to become a successful, full-fledged developer. Coding Dojo is more than just a 14-week bootcamp that offers three full stacks. We transform lives, fulfill dreams and open doors of opportunities to aspiring and dedicated developers through programming literacy and technical skill empowerment. One of our guiding principles is to fill the skill gap in the tech industry by creating a pool of talented and self-sufficient developers. 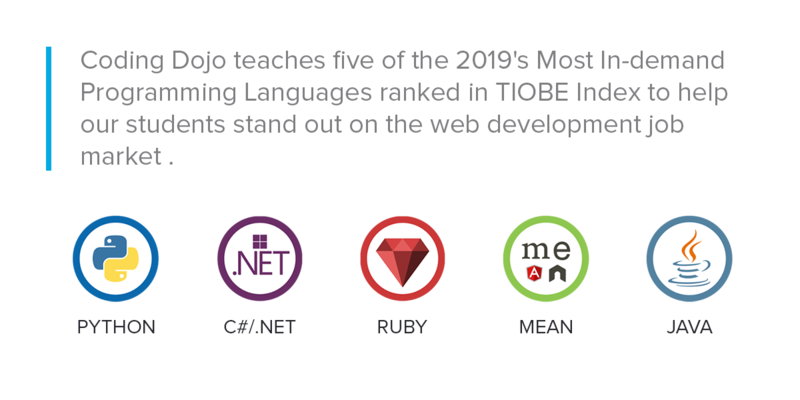 “We don’t just look at what are the languages people want to learn—the demand side—but also the languages companies need—the supply side…[It is because] the language that was really popular five years ago [won’t be as popular in the future]”, said Michael Choi, CEO of Coding Dojo. With that in mind, we strategically build our campuses on metropolitan areas, on arising tech-hubs as well as on local communities where the need for coding schools or bootcamps is high. Our primary goal is not just to give people access to quality education but to help them land a good job and have a better career whether they’re career shifters, job hunters or new developers. For the past 12 years, Coding Dojo’s curriculum has been refined and fine-tuned. We teach people how to code and help them achieve their full potential by providing our students with the necessary tools to update their skill sets. Apart from that, we continuously deliver excellent instruction and render outstanding service to produce skilled developers who are ready for that next challenge. If you’re interested in learning more about web development or wanting to become a developer, visit our website: www.codingdojo.com. Join us and become part of our growing community!